We offer both domestic and commercial removal service across Bristol and the UK. Whether you have a house, flat or office that needs re-location we will be happy to help. Our teams of experienced staff have all the knowledge, methods and equipment needed to ensure your possessions are handled with care and safely transported. Our Small Removals service can be tailored to your needs, allowing you to choose your level of involvement. If you don’t want to lift a finger we can send a two man team who will assist with your removal from start to finish, taking care of all the heavy lifting and carrying. Alternatively, if you’d like to be more involved yourself, we offer a one man and van service to assist with as much or as little of your removal as you require. For larger removal jobs in Bristol we offer a free survey where we can give you a no obligation quote. Alternatively, give us a call or fill out our Online Quote form and we’ll do our best to get back to you within the hour. We deal with enquiries 9am to 6pm, Monday to Friday. Ensure belongings are packed in manageable size boxes. Ensure beds and any large flat pack furniture is disassembled. Especially if it won’t fit through the door! Large items such as wardrobes fridges go in first so should be made accessible. Large items are followed by boxes and finally your more delicate items. 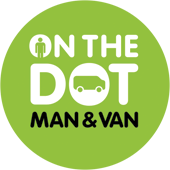 Why Choose On The Dot?